Rachel Daly and Nichelle Prince scored second half goals as the Houston Dash came from behind to beat FC Kansas City 2-1 on Sunday evening in front of a crowd of 1,703 fans at Children’s Mercy Victory Field in Kansas City, Missouri. The Dash played the game’s final 28 minutes with a player advantage after FC Kansas City’s Lo’eau LaBonta drew her second yellow card and was ejected in the 62nd minute. LaBonta’s foul came as she tried to regain possession of the ball near midfield and fouled Dash midfielder Andressa. It was a foul on Andressa that also earned LaBonta her first yellow card in the 35th minute. Following the red card, Houston scored off the ensuing free kick as Amber Brooks sent a long ball from her defensive side of the field into the box. The ball dropped in front of Prince, who collected it and slotted it past FC Kansas City goalkeeper Nicole Barnhart to give the Dash the 2-1 lead. It was Prince’s second career goal. She scored her first two weeks ago in Houston’s 4-2 loss to the Orlando Pride. FC Kansas City forward Shea Groom opened the scoring in first half stoppage time, receiving a pass about seven yards in front of goal from rookie defender Christina Gibbons, turning and quickly firing a left-footed shot past Dash goalkeeper Jane Campbell. The goal was Groom’s first of the season and first score since September 7, 2016. She led the team in scoring in 2016 with six goals. 45+1 "Shea Groom finally getting hers." Houston equalized in the 55th minute on Daly’s third goal of the year. Dash forward Carli Lloyd sent a through ball and found Daly in behind Kansas City defender Becky Sauerbrunn on the left side of the field. Daly’s initial shot was saved by Barnhart but the rebound fell right back to Daly, who knocked the ball into the open net. FC Kansas City had a golden opportunity to tie the match in the 69th minute but were denied by Campbell. Forward Brittany Ratcliffe dribbled in between a group of Houston defenders and unleashed a quick right-footed shot that rose over Campbell’s head. But the rookie goalkeeper jumped and tipped the ball up and into the crossbar. The rebound bounced safely to Brooks, who was able to play it out of the back and away from danger. FC Kansas City had a free kick near midfield deep into second half stoppage time but the Dash defense was able to clear away the long effort from Sauerbrunn. The Dash moved into 7th place with the win. They are now 4-7-1 with 13 points and have not lost in their last three games. FC Kansas City fell to 3-5-4 (13 points) with the loss. Attempt missed. Sydney Leroux (FC Kansas City) header from the centre of the box misses to the left. Assisted by Brittany Taylor with a cross. Substitution, Houston Dash. Denise O'Sullivan replaces Nichelle Prince. Attempt missed. Maegan Kelly (FC Kansas City) right footed shot from a difficult angle on the right misses to the right. Assisted by Sydney Leroux. Substitution, FC Kansas City. Maegan Kelly replaces Brittany Ratcliffe. Attempt saved. Carli Lloyd (Houston Dash) left footed shot from outside the box is saved in the top left corner. Assisted by Rachel Daly. Attempt missed. Carli Lloyd (Houston Dash) right footed shot from more than 35 yards is close, but misses the top right corner. Assisted by Andressinha. Attempt saved. Brittany Ratcliffe (FC Kansas City) right footed shot from outside the box is saved in the top centre of the goal. Attempt saved. Carli Lloyd (Houston Dash) left footed shot from outside the box is saved in the top right corner. Attempt saved. Nichelle Prince (Houston Dash) left footed shot from the centre of the box is saved in the bottom right corner. Goal! 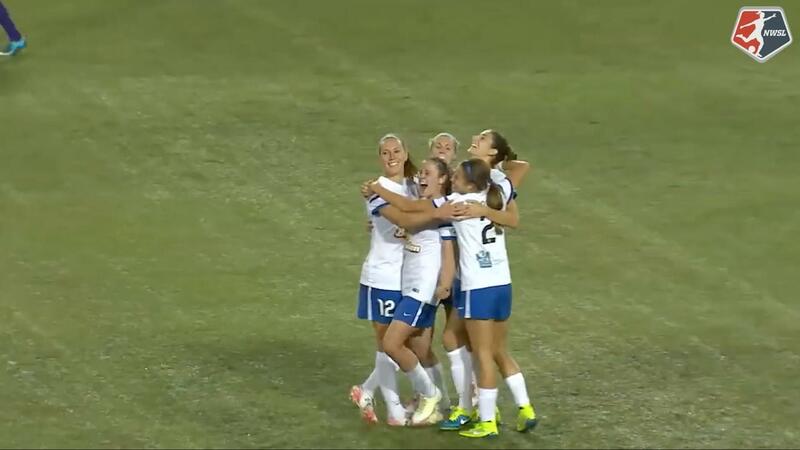 FC Kansas City 1, Houston Dash 2. Nichelle Prince (Houston Dash) right footed shot from the centre of the box to the bottom left corner. Assisted by Amber Brooks following a set piece situation. Second yellow card to Lo'eau LaBonta (FC Kansas City) for a bad foul. Attempt missed. Shea Groom (FC Kansas City) right footed shot from the centre of the box misses to the left. Assisted by Lo'eau LaBonta with a through ball. Offside, Houston Dash. Cambria Privett tries a through ball, but Carli Lloyd is caught offside. Hand ball by Desiree Scott (FC Kansas City). Offside, FC Kansas City. Shea Groom tries a through ball, but Rebecca Moros is caught offside. Attempt saved. Sydney Leroux (FC Kansas City) right footed shot from outside the box is saved in the top centre of the goal. Assisted by Rebecca Moros. Goal! FC Kansas City 1, Houston Dash 1. 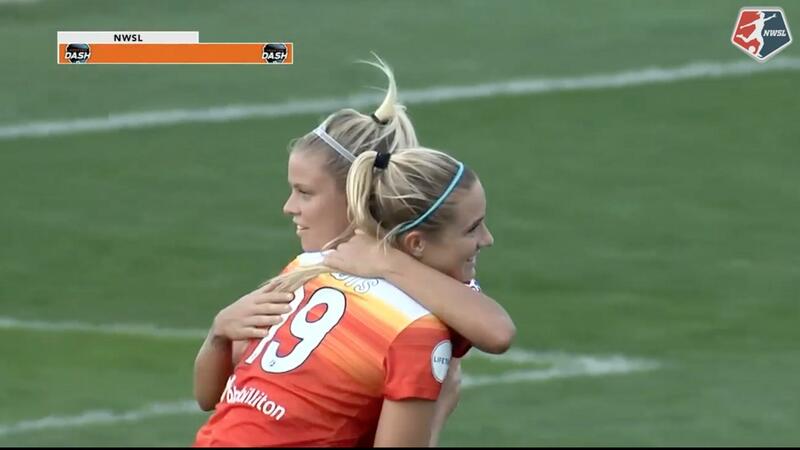 Rachel Daly (Houston Dash) left footed shot from the centre of the box to the bottom left corner. Attempt saved. Rachel Daly (Houston Dash) left footed shot from the centre of the box is saved in the bottom left corner. Assisted by Carli Lloyd with a through ball. Carli Lloyd (Houston Dash) is shown the yellow card for a bad foul. Christina Gibbons (FC Kansas City) is shown the yellow card for a bad foul. Caity Heap (Houston Dash) wins a free kick in the attacking half. Attempt missed. Carli Lloyd (Houston Dash) header from outside the box misses to the right. Assisted by Janine Beckie. Attempt blocked. Rachel Daly (Houston Dash) left footed shot from the centre of the box is blocked. Assisted by Janine Beckie. Goal! FC Kansas City 1, Houston Dash 0. Shea Groom (FC Kansas City) left footed shot from the centre of the box to the bottom left corner. Assisted by Christina Gibbons with a cross. Attempt blocked. Rachel Daly (Houston Dash) right footed shot from the left side of the box is blocked. Assisted by Poliana. Attempt missed. Andressinha (Houston Dash) right footed shot from outside the box misses to the left. Assisted by Poliana. Attempt missed. Lo'eau LaBonta (FC Kansas City) header from the centre of the box is high and wide to the left. Assisted by Brittany Taylor with a cross. Rebecca Moros (FC Kansas City) wins a free kick on the left wing. Attempt missed. Brittany Ratcliffe (FC Kansas City) left footed shot from a difficult angle on the left misses to the left. Assisted by Christina Gibbons. Attempt saved. Camille Levin (Houston Dash) right footed shot from outside the box is saved in the centre of the goal. Assisted by Carli Lloyd. Lo'eau LaBonta (FC Kansas City) is shown the yellow card for a bad foul. Attempt missed. Brittany Taylor (FC Kansas City) right footed shot from long range on the right is too high. Assisted by Shea Groom. Attempt missed. Nichelle Prince (Houston Dash) right footed shot from the centre of the box is too high. Assisted by Carli Lloyd with a headed pass. Attempt saved. Rachel Daly (Houston Dash) right footed shot from outside the box is saved in the bottom left corner. Assisted by Janine Beckie. Attempt missed. Carli Lloyd (Houston Dash) left footed shot from outside the box is just a bit too high. Assisted by Camille Levin. Attempt missed. Lo'eau LaBonta (FC Kansas City) right footed shot from outside the box is too high. Assisted by Yael Averbuch following a corner. Attempt blocked. Carli Lloyd (Houston Dash) header from the centre of the box is blocked. Assisted by Amber Brooks. Attempt missed. Sydney Leroux (FC Kansas City) header from the centre of the box is high and wide to the left. Assisted by Brittany Taylor with a cross. Attempt saved. Janine Beckie (Houston Dash) right footed shot from outside the box is saved in the centre of the goal. Assisted by Rachel Daly. Attempt missed. 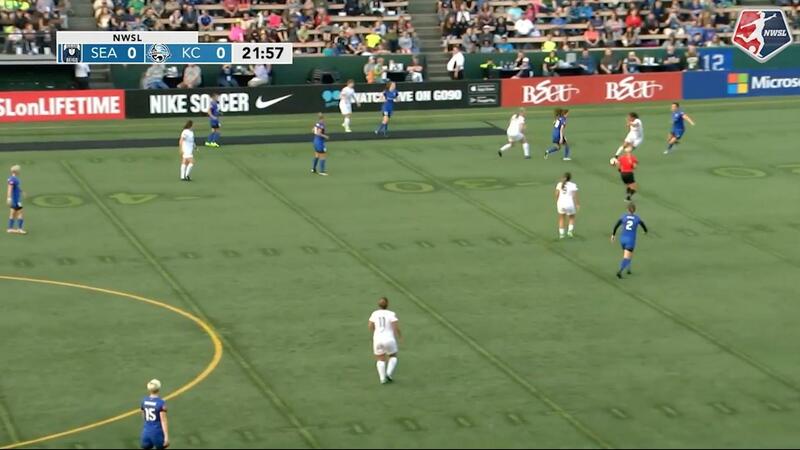 Brittany Ratcliffe (FC Kansas City) right footed shot from the centre of the box misses to the right. Assisted by Shea Groom. Attempt blocked. Lo'eau LaBonta (FC Kansas City) left footed shot from outside the box is blocked. Assisted by Brittany Ratcliffe.